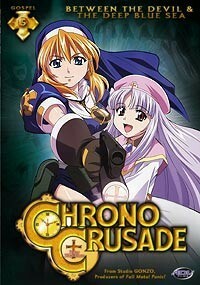 Home » Animegood Super Store » Chrono Crusade: Between The Devil & The DeepBlue Sea Vol. 05 DVD Brand NEW! Chrono Crusade: Between The Devil & The DeepBlue Sea Vol. 05 DVD Brand NEW! Chrono Crusade: Between The Devil The DeepBlue Sea Vol. 05 DVD Brand NEW Factory Seal! Official Licensed Product, 100% Authentic Guaranteed. Spoken Languages: English Japanese / Subtitles: English Format: DVD Item Code: 702727083228 Running Time: 75 Minutes Manufacturer: Section23 Films Ages: 13 Condition: Brand new Availability: In Stock – Usually Ship within 2 days! International Buyer: (We current ship International Canada, Australia and United Kingdom at this moment) First Class International Canada S/H 9.99 included insurance. First Class International Australia and United Kingdom S/H 12.99 included insurance. International shipments (Including Canada) may be subject to additional customs fees and duties may run into delays due to customs Inspection. Cost can be considerably higher for international destinations. Buyers are responsible for paying duties, taxes, and applicable customs brokerage fees separate from the merchandise cost. We will not be responsible for customs seizures are a result of materials being considered illegal in yours country. Please check to make sure you are in compliance with all local laws before you purchase. Buyers will general pay these fees upon receipt of your shipment. If you deny the delivery. Please understand that you will be responsible for all Cost of Shipment to your door-door and back to us. It will be very extremely costly. So please do not refuse a delivery your package. We will not able mark International Custom form as "Gift". This is in illegal practice in violation of US Customs law USC Title 13 Section 305 Chapter 9 which states penalties and 5 Years of Prison Per incident. Much appreciated your kindly understand. All Sales are Final.